Payments as low as $69/mo. When it comes to exotic veneers, some of the best specimens can be found on DW snare drums, and this Collectors Maple Snare, with its Redwood Stump veneer, is a strikingly beautiful example of fine American drum building. 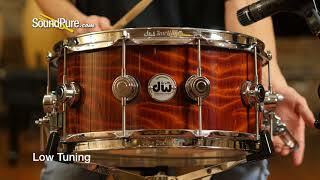 DW’s vertical low-timbre shell design features outer and inner plies of wood with vertically-oriented grain. This places less tension on the drum shell, thereby accentuating the natural low-end of the shell. The end result is a lower fundamental pitch and rich, deep resonance with plenty of clarity and articulation. This drum responds well across a wide range of tunings; it can be tuned low without losing articulation, or high without choking out or lacking body. The beautifully figured Redwood Stump veneer that adorns this drum provides a wonderful visual complement to the rich sounds this drum is capable of producing. Drummers seeking a snare that is both unique and versatile would do well to consider adding this beauty to their collection. In this video, Sound Pure drums specialist Barry Knain explains the various features of the DW 6.5x14 Collectors Exotic Maple Snare Drum, Redwood Stump, and tests it out in several different tuning ranges.